Jan Steen, a 17th century Dutch painter, set himself apart from his contemporaries through his richly varied body of work, which included works of portraiture, historical and biblical themes, genre painting and landscape. Nevertheless, there are distinctive characteristics in Steen’s art, in particular an emphasis on aspects of storytelling and humor in his paintings. 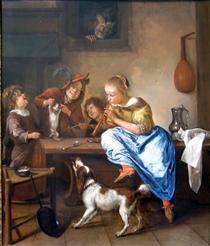 Jan Steen was born in 1626 in Leiden, to a well-off family of brewers. How Steen became interested in art is unknown, but in 1648 he was registered as a painter in the Leiden Guild of Saint Luke. Biographical accounts state that Steen studied under painters, Nicolaes Knüpfer in Utrecht and Adriaen van Ostade in Haarlem. He was either a student or an apprentice of painter Jan van Goyen in The Hague, and even married his daughter Margriet in 1649. The couple lived in The Hague, where Steen began building his reputation. 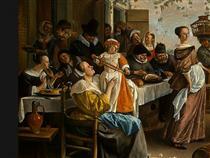 Steen often incorporated himself into his paintings, playing different roles: in The way you hear it (ca. 1663-1665) he offers a pipe to a young boy, in Merry Company on a Terrace (ca. 1673-1675) he is the inebriated innkeeper, and in Doctor’s Visit (1663-1665) he plays the comical role of the fool. The comical and dramatic elements of Steen’s art are related to his interest in the theater and the Rederijkers, the Dutch guild of Rhetoricians. Theater as a source of inspiration came through both in his style and choice of subject. Paintings such as Rhetoricians at a Window (1658-1665) and Rhetoricians (1665-1668) demonstrate Steen’s interest in theater. At the same time, the stage was an inspiration for many of his biblical and historical paintings. For example, in Esther, Ahasuerus and Haman (ca. 1668) the theatrical influence is evident in the architectural elements and the dramatized gestures of the characters. 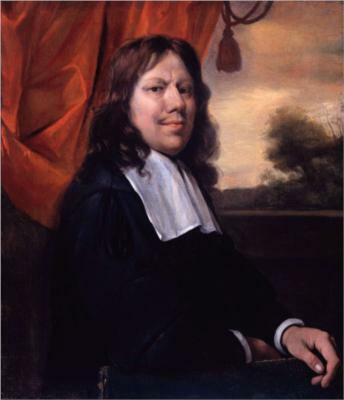 Steen lived in The Hague until 1654, and then moved to Delft, where he leased a brewery from a local brewer. While Steen continued to sell paintings, it was not enough to support his family, and the brewery became another source of income. Because of this, some have speculated that Steen’s festive scenes of drinking and merrymaking were based on his life as an innkeeper. Furthermore, since he often included himself in his group paintings, it is tempting to think that these portrayals were true to Steen’s life. However, it is more likely that Steen understood, that this was a way to position and promote himself as a comic painter. 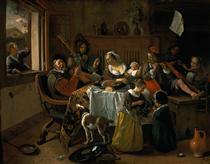 In 1660, Steen and his family moved to Haarlem. During this period, Steen worked with larger formats, and created some of his most recognizable paintings, such as Dancing Couple (1663). 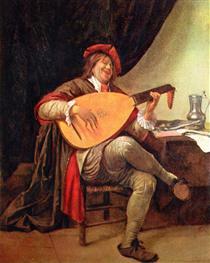 Over time, Steen showed more improvisation in his paintings. In Celebrating the Birth (1664) and The way you hear it, the spatial relations become less clear. Instead, Steen focused on constructing complex compositions and carefully developing the gestures and gazes of his figures. 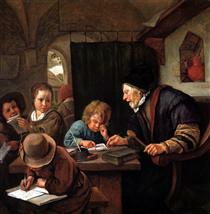 After the death of his wife Margriet in 1669, Steen moved to Leiden. 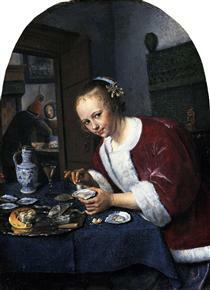 In 1673 he married Maria van Egmond, with whom he had a son shortly after. During the late 1660s and 1670s, Steen produced more biblical paintings than in earlier stages of his career, like Samson and Delilah (1668) and Wedding Feast at Cana (ca. 1670-1672). Steen died in 1679 at age fifty-three. Steen was born in Leiden, a town in Southern Holland, where his well-to-do, Catholic family were brewers who ran the tavern The Red Halbert for two generations. Steen's father even leased him a brewery of his own in Delf from the years 1654 until 1657. He was the eldest of eight or more children. Like his even more famous contemporary Rembrandt van Rijn, Jan Steen attended the Latin school and became a student in Leiden. He received his painterly education from Nicolaes Knupfer (1603–1660), a German painter of historical and figurative scenes in Utrecht. 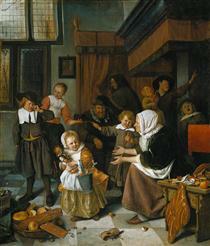 Influences of Knupfer can be found in Steen's use of composition and colour. Other sources of inspiration were Adriaen van Ostade and Isaac van Ostade, painters of rural scenes, who lived in Haarlem. Whether Steen actually studied with Ostade is not known. Dancing lesson Jan Steen ?